The James Island Connector, as I’ve said before, is a pretty simple race. You just run up Calhoun Street for a couple of blocks and then you’re on the bridge. There are three different hills on the Connector, ranging in horror from mild annoyance to some of us, to heartache for those who are a bit less experienced. There was a 5K Walk as well, but those folks just walked half-way across the bridge and turned around. Of course I signed up for the 10K event. I knew that I would do reasonably well, but I didn’t guess that I would establish a new Personal Record! This event is so crazy-close to my apartment that I had considered running to it as a warm-up exercise. It’s about a mile, so it would work out pretty well. But then, what would I do with my race packet? I didn’t want to carry the shirt and the bag of advertisements with me, so I brought the car. Showing up early means parking for free across the street from the pavilion. Seriously, if I had used a wider lens you might have been able to see my car in that photo below. It was wonderful. As with other events, this one had a mascot. I normally see the Piggley Wiggley Pig at running events, but over the past year I’ve seeing this yellow ant running around. Angie the Ant is a children’s book, and it’s apparently had enough success to put some lady in a big crazy suit for a year. Not only that, but I’m told that the author is writing a second book. So what you’re seeing in the photo is an attempt to promote a book, and to make money. They had a booth and everything. As a cartoonist, I think this is wonderful. I haven’t done much research into the character, but somewhere out there is an illustrator who is making a living by drawing cartoons. Can life possibly get better than that? With winter on the way, South Carolina is returning to its spit-personality style of weather. Cold in the morning, hot in the afternoon. 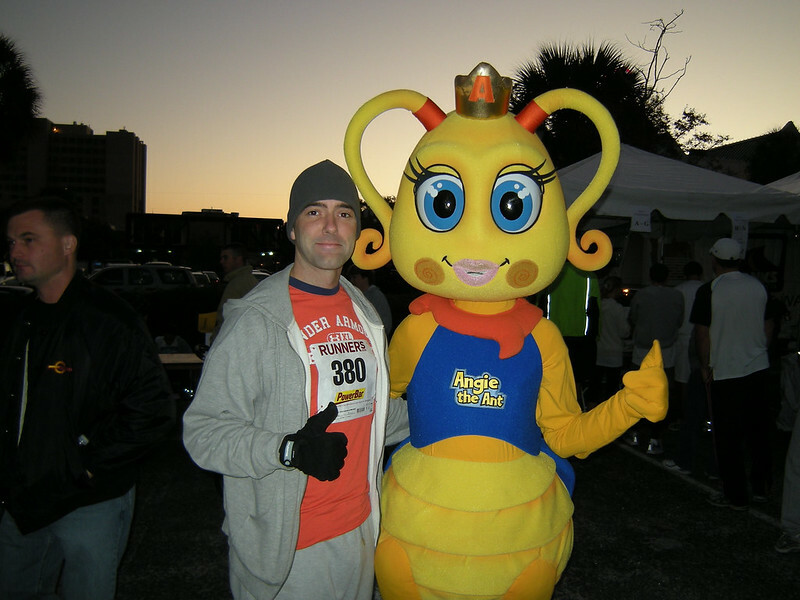 When I arrived before sunrise I needed the layers that you can see in my photo with Angie the Ant. As race-time approached, I had to shed them and toss the clothes into the car along with my race packet. I’m always a bit torn on whether to keep the hat and gloves. 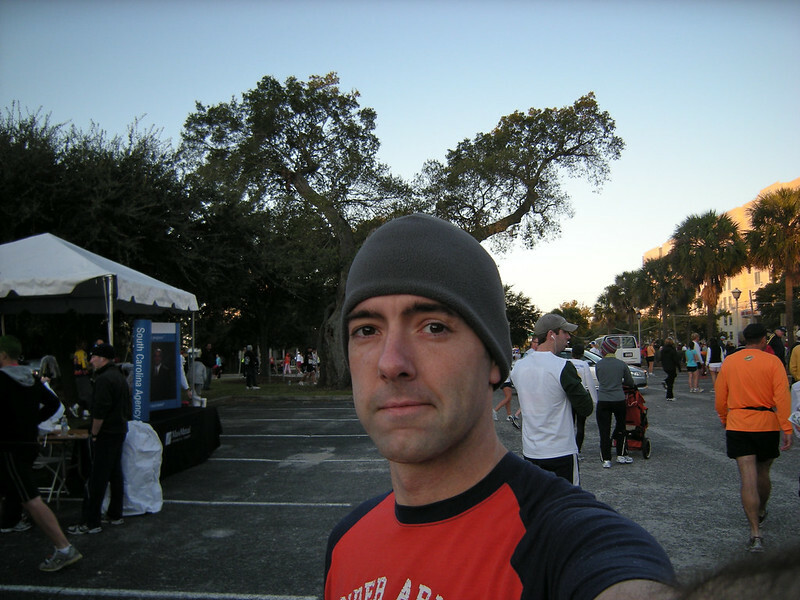 They would obviously have to go once my body temperature was up to speed, but I didn’t want to stand around at the Starting Line with numb fingers and all of my heat leaking out through my buzz-cut head. Another half-hour and I would have put them in the car, but in this case I needed them while we all waited for the race to start. In the first picture below, you can see the beginning of the James Island Connector. We go up, whip around to the left and then we’re off to James Island. I took more detailed photos during the 2007 Connector Run. I have to warn you, however, that I was stuck with a crummy camera at the time. The pics are a little washed out at times. There was nothing too memorable about the bridge. I watched the hills go by, and I spoke to a couple of people on the way. I passed a lot of folks. A lot of folks passed me. I focused on keeping a steady pace and on not slowing down. Someone I was speaking to stopped to tie her shoe, and I actually stopped for a second or so before telling her that I would see her down the road. Even though I didn’t have a particular goal, I wanted to see how I could do in a 10K race with a few hills in it. My 5K time has suffered a little since I started training for longer, slower distances. I was curious to see if a 10K race would suit me more. Everything changed when I got a visual on the clock. I started picking up the pace, determined to give every bit of energy to the road on the way through the Finish Line. Everything changed again when I saw the time on the clock… forty-nine minutes and change. If I ran even faster, then I could break 50 minutes. I could score a Personal Record without even planning to. What if I had pushed for a PR from the beginning? What if there hadn’t been any hills? What if I could worry about that later so I could get over the line before that thing clicks over to fifty? I pushed as hard as I could. I heard a few people comment about my sprint. That always happens when the crowd notices a person who’s really working. I flew across the Finish Line with a time of 49:49. I’ll have to check the official time when it’s posted… I don’t think our chips were measured at the beginning. I think they just started the race and measured when we finished. If that’s the case, then I may have gone even faster from the exact Start to the exact Finish. Whatever the case, this is proof that I can push my time down even farther. It’s pretty exciting stuff. As usual, I got a few shots of other people finishing the race. I don’t know the first guy, but the lady in the second photo is Janet. I seem to Finish 5K races right next to her, even though we don’t start together. It’s weird. Below her is Lane, the boyfriend of my buddy Caitlin. 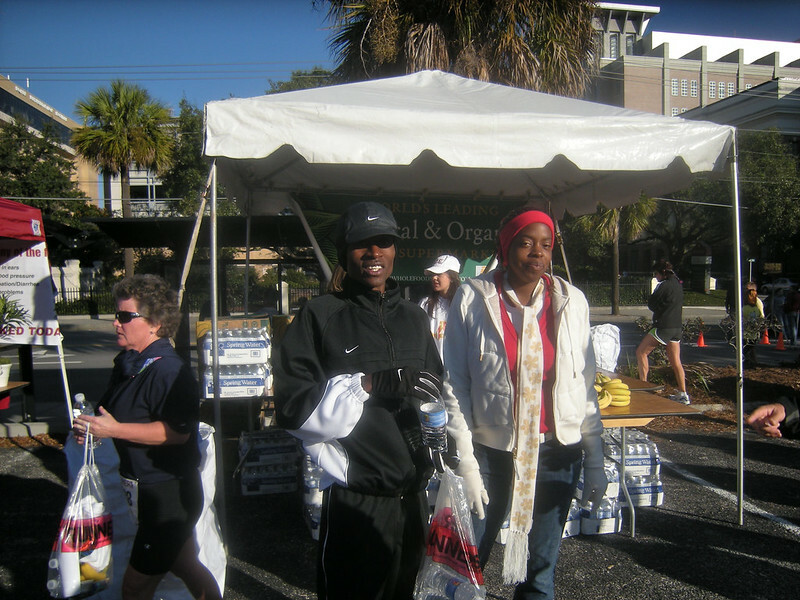 She’s appeared on this site once before, in my article about the 2008 Cooper River Bridge Run. My apologies for the blurred photos. I got some sweat on the lens. After getting it wet and repeatedly dropping my camera, I am grateful for the damage plan I bought along with it. Aside from the usual mooching of fruit, bagels and water from nearby tables, there’s a bit of hanging around which happens after a race. This is when we catch up with our racing buddies and compare notes. There are people that I only see at races, like Janet. Below you can see her with some dudes she was with. They told me their names, but I forgot. I feel especially bad about that because both guys were really nice. (Fortunately, guys aren’t too sensitive about that sort of thing.) In the second photo you can see Keith, who recently participated in the Marine Corps Marathon in Washington, DC. And here, below, is Maurice. He made third place. You can’t tell from this photo, but he looks like a muscular diagram from a medical textbook. Sometimes I think Meg goes to the gym just so she can see him once in a while. She certainly isn’t going to catch him if they go running together. Maurice is one of the nicest guys around, and always encourages people to keep improving themselves by degrees. He’s soft-spoken and mild-mannered, and it would be very difficult to find a person who doesn’t like him. I was happy to see him make Third Place, especially after his Fourth Place finish at the Race for the Cure. I would have stuck around to see the awards handed out, but I was getting steadily colder and I wanted a shower. I said my goodbyes and hit the road. Within ten minutes, I was home and getting cleaned up. I love living downtown. This is a big deal. I had no idea that I could do this well in a 10K. 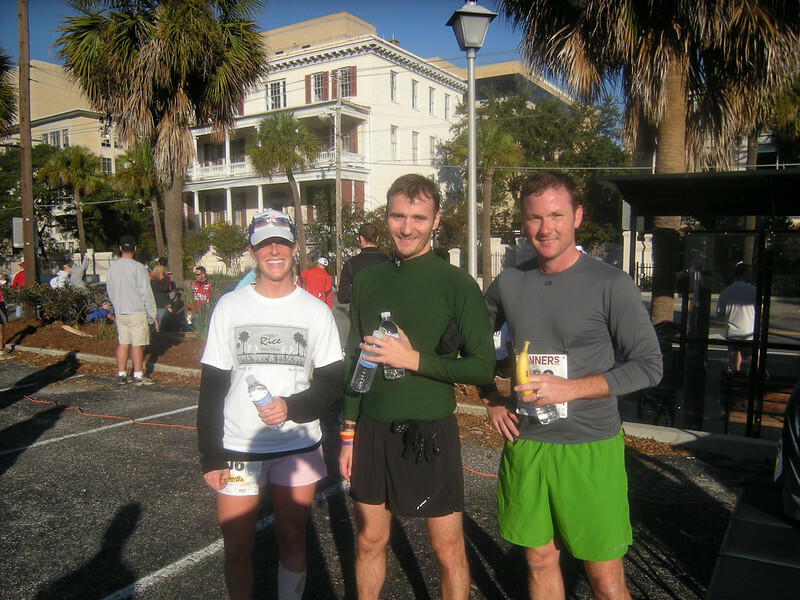 After the marathon in December, I think I’ll focus more on shorter, faster distances. I’m not sure where that will lead, but I won’t find out unless I give it a go. Another race behind me, and more to come!